Dolphin 2.1 will be released as part of KDE applications 4.9 on the first of August and to me this is a very special release: After 6 years of development, around 2700 commits and a lot of fun I'll be forwarding the maintainership to Frank Reininghaus. Frank did a great job during the last years to improve Dolphin and I'm really glad that he accepted the maintainership. For me forwarding the maintainership also means that I won't provide any bugfixes or features for Dolphin anymore. Probably this step is quite surprising for most readers and I think I owe an explanation. Before going into details it might be useful to first describe the reasons for developing Dolphin at all. At the beginning of 2006 I wanted to gain some experience with Qt and I've been looking for a small project. I liked the functionality of Konqueror but was not happy with the user interface - I thought that writing a small and fast file manager fitting just for my own needs and to learn Qt should not be that hard (if somebody would have told me that I'll be spending at least 6 years on this project I probably would have given up immediately). Thanks to some great classes in kdelibs I was able to browse through directories only a few hours later and my (wrong) assumption "this should not be that hard" got tightened. Around mid of 2006 I've released the 0.5 version of Dolphin at kde-apps.org. Making a long story short: Matthias Ettrich called me and asked whether I want to help contributing to the filemanager for KDE 4.0. David Faure was very busy with porting parts of kdelibs to that time and more interested in doing the tricky and challenging parts instead of the "boring user interface programming" (I cannot remember anymore the exact words Matthias has used, but it was something like this). Well, suddenly I was part of the KDE community, got great support from Aaron J. Seigo and it started to get a great experience for me to contribute to such a large project. Learning Qt was secondary then, it was more about learning how the whole development for such a big project works and how decisions are made. The KDE community is still great and there are enough things left to make Dolphin better, so what has changed since then for me? One thing is that the time required to keep Dolphin in good shape increased during the last years. I'm doing this project in my spare-time and usually have spend around one evening per week on Dolphin. Especially during the last 2 years this time has increased. In the longterm especially the (for me absolutely necessary) step to port Dolphin to QtQuick2 is something I won't be able to do within a sane timeframe. The interesting thing is that porting the new view-engine to QtQuick2 is probably the easiest part: There is a clean seperation of the representation and the model and exchanging the representation should be doable within a reasonable amount of time. I guess with Qt 5.1 or 5.2 (I don't know) there will be desktop-components for QtQuick2 and porting Dolphin to this components will be a very timeconsuming and boring task: All the settings-pages, the URL-navigator, the information-panel, the search-interface, the tooltips, ... - this is just not doable anymore in my spare-time. Of course you might ask whether a port to QtQuick2 is really necessary. But to me in the scope of KDE QtQuick2 is the only solution to be able to compete with the other big desktop environments out there in terms of a responsive and beautiful interface. So would it help if other developers would join the Dolphin project and take care for doing the QtQuick2 port? Sadly for me this still would not be enough to keep on maintaining Dolphin, as there is another reason to quit contributing: I'm using KDE since version 1.2 and I never cared what market share KDE or Linux on the desktop has. However to me it was important that the desktop-environment I'm using and spending time for can compete with the desktops-environments from Microsoft and Apple. As user I always had the impression that I can do my regular tasks like reading e-mails, browsing, managing my photo- and music-collection, rarely writing a document, maintaining my contacts, adding calendar-entries... in a more efficient and comfortable way than on the other desktop-environments. But at least for my regular tasks as user this has changed during the last couple of years. It is tricky to give examples without pointing fingers to parts of KDE where I think we are not competitive anymore, so I won't do this. The complexity of the non-user-interface-parts of applications has increased a lot. Web-browsers are a good example: While the interface got simplified during the last years, the engines showing web-pages got really complex and are maintained mostly by fulltime-developers in the meantime. There seems to be a similar trend in PIM-applications ("cloud"), chat-clients (one simple user-interface, a various number of protocols) and for desktop-search-engines (simple user-interface, really complex stuff going on behind the scenes). Working on the non-user-interface parts of applications can be challenging and this is not something that most freetime-contributors are striving for. But if there are not enough contributors for the complex stuff behind the scenes and if no company is willing to invest fulltime-developers to work on this... - well then we are losing ground. And even if Gnome seems to get more support from companies, I don't see a big difference to KDE here. Probably my explanation/guess/theory is nonsense and utterly wrong. But this does not change my point of view that at least for my tasks I can work in a more efficient and comfortable way on other desktop environments in the meantime. And this aspect makes it hard to keep up the motivation for investigating a lot of spare-time into KDE. I hope this does not sound like a blog-entry from a "frustrated developer" - this is not the case :-) I'm leaving the project at a stage where I still liked to contribute and where I enjoyed being part of KDE. I wish KDE all the best for the future and I'm proud that I got the chance during the last years being part of this community! Actually, I think it would still be useful to point out where KDE apps are lacking (of course, you should give only constructive criticism). This would help the developers to know what is actually wrong with the software. Thanks a lot for your work, I am using dolphin every day at work, and find it awesome. Fast, clean and efficient. In my opinion, it really shines in KDE. You're leaving behind you a great application. Thank you! I think too, it would be good to point out stuff that you feel lacking. I mean, if you, as a longtime developer and active member of the kde community, are not supposed to criticize, who is? No one? And thx for your great work!! I think you should be specific and point fingers as to why you're leaving - as a respected developer your leaving is a sad day for KDE and those reasons need to be taken into account as we move forward. People with your abilities and vision are what should be making KDE the preeminent desktop environment. May I ask, which desktop do you use instead now? A big thank you for your work from a KDE user who love Dolphin. As a daily KDE user, I feel it's not too hard to imagine the kind of stuff Pete is talking about. I think his frustrations are probably not that different to other people's. I am also interested in knowing what they are, though, because the insight from a senior developer like him is highly interesting. With what he says about KDE and GNOME, I think it is clear that he's not using Linux anymore. If I had to bet, I'd say he's there with the Lions. For starters, thanks a lot for all your work. 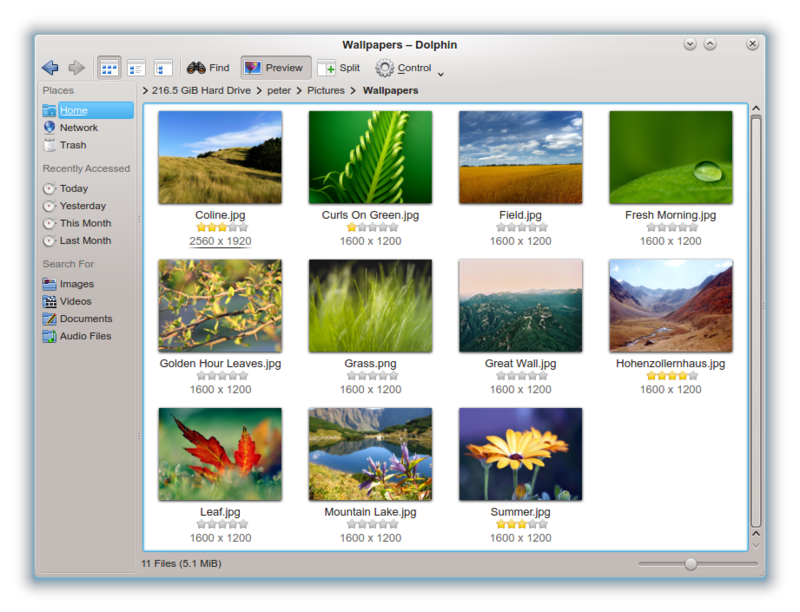 Dolphin is, and has always been, a shining example of the power of KDE 4. But, I have to say I agree with you. Although I haven't found a replacement, I feel less and less love for KDE and all its microbugs/quirks/general unpolishedness. Honestly, I still use KDE for work and home, but I'm finding it harder and harder to honestly recommend it as a credible option to other systems. Good luck, and, again, thanks for your contributions! Dolphin has always been one of my go-to examples of a "near perfect KDE application". We need more people like you in KDE. Good luck in whatever you're doing next! And thanks for being a nice maintainer to deal with. Pointing out things you think lack something, should be considered constructive feedback. Also telling why you move where, might lead to more progress in some areas. First one to say a big thanks for all the great work. 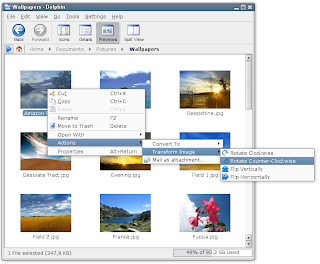 I remembered not liking dolphin at first and was always defaulting to konqueror however in time dolphin packed more features and became more usable that it is one of the killer apps that keeps me glued to KDE. Its never easy taking dolphin to that point especially for someone doing it as a labour of love. I do understand with lacking motivation and I wish you the best in whatever you do. Yes KDE is not perfect but I guess meets my needs more than any other desktop environment I have tried (gnome, xfce, windows and mac) I always find myself coming back. I sometimes wish KDE had more cooperate backing like the gnome guys because lord knows many areas of kde would do better with an army of paid maintainers. but again he who pays the piper dictates the tunes so maybe that might not be such a good thing. That's not good news at all! Though i do think i get your point. The KDE PIM applications (KMail, KOrganizer and the other Kontact apps) are hopelessly outdated and not really up to modern standards anymore. They might have been fine for the KDE 3.x series and fit the era very well. Nowadays it indeed has to look simple yet be advanced at the same time. My guess is you "fall" for Mac? ^_- I know mac is indeed very attractive and easy to convince linux people in using it. I'm having one myself as well and i quite like it. Yet i take inspiration from it and try to use that in Linux. Good luck with your next adventures! I really hope you return to Dolphin once KDE is in a better (visual) shape. Thanks for your work, guy. Dolphin is the better file manager I've ever used. Peter, thank you. Your hard work on Dolphin has made my whole computing experience better. There is a cold beer waiting for you in Beersheba. Interesting post. Particularly interesting for me because the actual one killer feature of KDE, that makes me hate instantly other OSes when I have to use them is... the lack of Dolphin. More specifically, Dolphin's CTRL+I filter is exactly what you are talking about: dreadfully simple, yet so useful that I'm quickly frustrated when it's not here. Why other file managers don't have this is beyond me. I wish that was 1-st April. Like others here I would be interested in knowing the issues you experience. If you want to share, feel free to notify me privately in case you don't want to share in public (which I can understand). You're on your death bed. Where to do want to die. Maybe there's life in you to keep living if you just realise what matters and that it's not so bad after all. Thanks for everything Peter. Dolphin is one of my favorite applications, but that's not the only reason why I think you're an awesome maintainer. You were always fast at replying to bug reports, and even if your opinion differed, you listened to the users and explained your reasons. It's very sad to see you leave; without doubt, we need more developers like you. I wish you all the best in your next adventures and hope you'll be back one day to rediscover the evolved Dolphin. Thank you for your work, the many wonderful blog posts, and what you are leaving behind: the probably best file manager I know. As I see it, this has two solutions. Or you leave (that depends only on you), or you get hired to work in Dolphin as a full time job, with a clear career and goal-based payments, so you won't have to work in Dolphin in your spare time, but in your work time. That depends on someone else. So, community, can we make option 2 happen? What Linux projects lack is Management. Mark Shuttleworth is a prime example of how projects, mainly Debian and Gnome can be pulled to a direction that make it a success. If Pete is upset over the future of KDE then maybe he could start a new KDE mirror that takes KDE in a new innovative direction. Maybe even tie it in with a base OS('distribution') as well. Peter could become a Linux star. I use KDE and love it. It works. You usually need innovation to suit new hardware. Example tablet touch screens, projection interaction, etc. Data interoperability is another point of change, that between applications. I thought KDE was doing well at addressing these areas, even though we are yet to see a mainstream KDE/Linux tablet. I think KDE is in dark times as there is economic woes befalling businesses. That has to take off the shine and good vibes of any team or project. ps. dolphin is good also for qt-razor desktop environment. Thanks a lot for all your work, Peter, and for a great application. You will be missed. What KDE lacks (imho, as best as I can tell from the sidelines) is a management structure and a visionary that can steer the vessel similar to Linus and the Kernel or as e8hffff states Shuttleworth and Ubuntu. As much as the 4 series is a success it is also a failure because many of the core technologies that are supposed to define it have yet to be fully delivered upon, accepted and incorporated (Telepethy, Nepomuk, Akonadi and to a lesser extent Activites). There needs to be someone with the resources (person power) to decide and implement those things that others don't because they're not "fun" even though they are needed to make things accessible and fully functioning. ps - Peter, please stay and work towards making the world of KDE a better place even if you no longer code. I want to thank you for one of my absolute favorite desktop applications! Especially since 2.0 Dolphin is simply beautiful and a strong argument for using KDE SC and Linux! I see it as very competitive, even to the Finder (though this is not hard) and the most user-friendly and feature-rich file manager with the prettiest appearance at the moment. Thank you! I think Peter needs a good holiday or break. When you're in a routine and or have exceptions on your shoulders, pressure and monotonicity can build. Peter have a break and then return as a contributor as you say you might at the end of your blog. If you want new direction then leave or take a step up. My ride with KDE (as user that is) has been great, and the KDE and Qt potential is still excellent. My opinion is that KDE has ceased to exploit that potential for desktop usage. I believe it's general for KDE, and no single person is to blame. When Mr Siego stepped down, KDE was thight and focused, but around that time everything began to move astray in all directions. I have no doubt whatsoever wrt the potential in every aspect of Qt/KDE, but KDE is no longer a thight ship. It wobbles. As much as I support the tablet effort, my view is that KDE desktop is suffering because of it, and it's been like that for a long time. I'd love to see KDE releasing its potential, but I just cannot see that happening until KDE realises that the "free spirit era" now hurts KDE badly. I'll be more than happy to revisit KDE again, but not under the current circumstances - to return, I'll need a reason. Love it but can't live with it. Meanwhile I'll move to Mac. Thank you for building Dolphin. I see it the best manager and really wish there would be more people like you in the community. Have fun with whatever project you end up building. This is what I think about KDE. Hi ! Well, that's very sad, but understandable : no-one should have to devote his/her life to free software, as there should be enough of us to fill the gaps. The truth is there are often a couple of very productive individuals who make the difference. Peter is entitled to his choices, I respect that and couldn't thank him enough for what he did ! I would love Peter to elaborate about the reasons he doesn't find Linux-based environments to be competitive anymore. Well, at the same time, I'm pretty sure things could be done differently. There are also many very solid OSS projects after all. But we HAVE to organize better and lose less resources. I finally left windoze a decade ago << more then happy about that :) - I could not imagine still using that PITA (pain in the ...) software. It is simply the worst. I used quite a variety of desktop environments over the time - but none is like KDE when it comes to the window handling. Meta + Mouse => awesome. Keep in front button, yakuake etc. etc. - unbeatable. I'm a part time mac user by now << basically cause my mb-pro17" is not really playing well with any distro I tried. The mac is a good surfing and multimedia-play companion. But when I do development I don't won't to miss my Linux Box with a KDE. Dolphin works fine the way it is ... why spend the time to port it to QtQuick? On the other hand, improvements to Dolphin have been wonderful. It is a joy to use. I no longer miss Konqueror. Thanks. Did somebody buy ppenz a seriously overpriced macbook pro "trophy box" with an SSD? Oddly, I am pushing to move our developers away from MBP's because System76 laptops are better for half the price and Linux is our deployment target (only Pixar or a fool uses OSX for a large-scale server deployment). The benefit is the tool-chain is much easier to install and maintain, and the entire enterprise stack can run on a laptop. I was always a fan of konqueror's multi-pane file display, and actually argued against Dolphin in the first place. Because sometimes power-users need more than 2 panes. But I must admit Dolphin as it exists today works quite well. In any event, ppenz, best of luck to you. Once you get your fill of the OSX iTunes store (and what a UI nightmare that is), it would be great to welcome you back. And final thought: Yes, the Akanodi framework has been a complete mess to date. Thanks to Thunderbird and Webmail, I no longer even try to make it work. as a long time KDE user (since 1996/97) and I am slowly losing love towards KDE, which was my exclusive desktop for more than a decade in total. Especially the Akonadi mess caused much bitterness in me. In 2000 the distance between proprietary and FOSS desktop was smaller than today and I thought it would shrink instead of growing. I now spend more and more time on Android. Thanks for your work, your contribution was very, very valuable. I'd like to thank you with all my heart for your work, you made my digital life a lot better. I switched to KDE from Gnome about a year ago. I'm very satisfied with experience. Dolphin is a great file manager. I have high hopes for KDE and dolphin as well. Good luck with your next projects. Thanks for your great work on Dolphin. I can understand your concerns about the future of KDE. KDE is a great project with great apps, but while some parts of it are in great shape other parts are rather in a bad condition (especially Akonadi-related applications, settings, browser). What KDE seems to lack is a over-coordination which tries to find resources where people are missing. I'm a long time KDE fan and will be using Dolphin for years to come. I don't blame you about porting to the new Qt. Though in a truly well designed environment you shouldn't have to. In the design and development of complex software there are people whose passion is to take the complexity, in a limited context, and build components that distill the complex algorithms into specific highly useful pieces so as to present to the developer what they want. It is this part of the development organization that linux, and other systems, lacks. Thank you for Dolphin. Used it since the d3lphin days. Think it is a no -the- killer KDE app. Don't let the haters (Konqueror groupies) get you down! Thank you for your brilliant work! Best of luck for whatever lies ahead. Thank you for all your hard work. It is appreciated. I use KDE every day and I guess I'm one of the lucky people for whom it is a perfect fit. Dolphin is the only reason I can say that KDE is better than any other DE I ever try. I can understand your reason, but it is still a very bad news to me. I hope you'll find your reason to come back soon. Thanks for all your hard work. I use it every day. I wan to also say Big Thank you for all your work. Dolphin restored my faith in file manager usability and I used it daily as an example how open source and Linux is so much better than alternatives. Thank you, Peter, for all your great work! I am afraid I lost love for KDE a few years back, now I use XFCE. Hope your next adventures are good! Wow, sad news... but thanks for all the work you have done on Dolphin. I *just* switched to KDE from Gnome a few weeks ago, and Dolphin is a big part of the reason that I'm really loving KDE. Thanks for all the work and I hope you find the inspiration to work on another open source project. 2. Stop & disable Akonadi, Nepomuk. 3. Remove Akonadi, Nepomuk, PIM, Strigi, etc etc as far as i can remove. 5. Hei.. akonadi icon still in my panel and nepomuk memory setting stuck in 50 MB. 7. Try some tips from another users. 9. Ok.. i can't purge some packages of Akonadi, Nepomuk, PIM, Semantic and friends, but at least they are disable now. 11. Install some themes, fix font etc, Hei.. my system ok now..
12. Wow.. KDE new version in my update list. 14. OMG.. AkonadiSemanticNepomuk packages is back. Sometimes i almost give up, but i'm still using Linux desktop. Does this mean that Konqueror will be the default filemanager in KDE again? Because Microsoft DID get it right when they decided to merge the filemanager and the browser. Thank you For all your work. Dolphin is the best file manager on any desktop in my opinion. Linux on the desktop is dead. Its 2012, nobody wants to program in C++. I have been using Linux since 1993, but I use Mac on the desktop. Nobody will get hired from using C++/Qt. The world is C# and Objective-C. Why waste time on KDE? KOffice, just pay 70$ for iWork instead and save millions of dollars spent on KDE development. Abandon KDE and GNOME. They are dead. Its no longer competitive on the desktop. Wake up people. The only two linux applications worth running in my opinion: Gimp and Inkscape. (non-KDE apps) what killer apps are there in KDE? (answer: none) there are no great Linux desktop apps really. QT has no market share and is a dead tool. Any real development is on Android and iOS. There is no demand for Qt programmers. You will starve and there are no jobs for either Gnome or KDE programmers. Like the other comments I wish to thank you for all the hard work on Dolphin. It was very much appreciated and you will surely be missed. Someone else already asked, but I'm very curious as well, what is your preferred desktop environment? Thanks for your wonderful work! Peter, I left Windows in XP version, and dolphin has been the best file manager I've ever seen. Thaks a lot for your so great work. Good to see human side of an open source developer. This is a forever running debate on applicability of your product. I am an Indian and working as a scientist in a government organisation and say something from both capacities. There is two phases in technology evolution. In first phase little amount of efforts give a big boost to the attractiveness while the second, testing, phase involves application of lot of efforts to gain small advantages in attractiveness. One of the senior person advised me in the beginning that you have all the time in the world to improve you and your product and given the context it meant I can only rely on myself. The second part is about the way we see our product. We call it our babies and sometimes we are asked to take leaves to get recharged and think about in other ways about the problem. We are even told that temporary separation from wife is also good for longevity of the relationship. My peers, which include my father as well, tells me to keep playing the game. Sometimes you miss after your best attempt and sometimes mediocre attempts work. Life is just like that. You look much more older to me (I born in 1981). Like may before me, I would also request you to reconsider your decision but after a sufficiently long break. All of us are human beings. KDE needs new programmers with a fresh view and an appetite to offer new clean code. It is the best GUI and it will remain so. I want my KDE3 back! KDE4 ist just such a huge step backwards in terms of functionality and usefulness, it's horrible. I tried Ubuntu for a while, as Gnome2 is an imitation of KDE3. But now, they are forcing their users to Unity. Trinity is the only hope in terms of desktop development. Forget KDE4, forget Gnome3, and forget Unity! Sad to read this. Thank you Peter for all the time you put in Dolphin, it's a joy to use. I wish I had the opportunity to meet you in person, but I guess this is not going to happen. All the best, and rest assured you will be warmly welcomed back should you ever feel home-sick. Thanks for your great work. I use Dolphin every day and I really appreciate your work. I hope the best for you and your career. Dolphin is one of the more solid KDE programs and stays a pleasure to use. If you tire of whatever new DE you end up using, don't hesitate to visit the camp again. We'll have cookies. There is NO reason whatsoever to port stuff like settings pages to QtQuick2. Widgets do the job perfectly fine for this. Do not confuse "done" with "deprecated". There is no new feature really needed in widgets, for them to be perfectly fine for developing settings pages. Who needs fancy animations in settings pages, or OpenGL hardware acceleration?? And even "done" is something I'm fighting against. Widgets will keep evolving, in fact I have a lengthy TODO list of small improvements to make for Qt-5.1, and KDAB will soon name a maintainer for QtWidgets. All in all, I do not understand where your frustration as a developer comes from -- but I of course respect your decision, everyone is free to leave an opensource project whenever he wants, especially the way you're doing it (with clear transfer of maintainership to someone else). Usability is the biggest issue for KDE at the moment. Non technical users have troubles using it. I believe ROSA is trying to fix that gap. I was surprised when GNOME 3 was released and I didn't understand reasons for design decisions till I recieved my 24 inches LCD. It is really annoying to use KDE on wide screens. Thank you for your great work on dolphin. I think you really should call the problems by their name. For me the biggest problem with kde is the PIM stuff. Kmail2 is a disaster (it actually deleted a mail right in front of my eyes a few days ago). I wonder what your specific problem with kde is. Akonadi and Nepomuk (with all its broken indexers) just killed the fun of using KDE. Who cares about information duplication in 2012? Akonadi is just not good for anything. Hook plasmoids into kontact api and get the same out of it without f*cking up EVERYTHING PIM related. Nepomuk is a pita since forever. Shoving stuff onto users early - discussable. Shoving _completely_ broken stuff on users _for years_ - just lacks any sane reasoning. Imho KDE is _only_ usable on source-distros where you can just really get rid of those things. But then why would i choose KDE if i can't even use an integrated mail program anymore? It's been that way from day one of KDE 4. It's been that way when users should adopt KDE 4 early and not complain too much about randomly broken stuff here and there. Bugs are just normal and they do slip into "stable" releases. I bet most users could live with those. But to all the problems that can't be avoided completely, there's always those two pitas described before. And those are there because some guys decided so. And they stay there because some guys want it that way. Thanks for the best filemanager though! Wish you all the best! "Linux is no longer competitive on the Desktop." - I can't let this claim stand! First of all, we all know really good that you must have solid computer skills to install and be totally content with a Linux distro, for two decades now, unless you give up a lot of control to someone like Canonical. THEN the features and even usability of Desktop applications are today on par with commercial environments. This applies for many parts of the desktop - and KDE SC's very integrated approach is very great. But when it comes to PIM or "lifestyle" programs like Garageband, Keynote or iTunes (I use Amarok for it's features since 2006, but it really is a mess to work into) we can't compete anymore. We have dark corners with little light. The commercial products out there have gigantic dev teams for this programs and we don't have the resources of super design specialists who could volunteer to close this gap. For me it's enough and when I need specialized tools I boot into OSx86. But for the common desktop work KDE SC is for me a lot more attractive than any other environment in the software world (for me, as a geeky, semi-professional user), and we step up our advantages from release to release. We shouldn't betray ourselves in thinking we could deliver the best DE for all users, but we really do a great job in making the most attractive DE for advanced users. And it seams that due to Apple's "iOS-ification" of OS X it's not totally unlikely to welcome more and more Pro users from the Mac platform over the next time. Your work on dolphin has been great and I understand your frustration regarding the desktop. Making a successful desktop requires a "vision". You had the right vision for the file manager and you also know what are the requirements for the future. The KDE desktop got a wrong "vision". Some people, like A. Seigo, tried to organize a lot of things and bring their vision to KDE. But we have to consider that they failed. It is obviously not enough to be a talented writer or speaker as long as your vision is wrong. A wrong concept has been forced into KDE while some of the commercial alternatives manage to innovate in the right direction. The dolphin philosophy should be applied for the entire desktop. The UI should be both simple and modern, responsive and animated. The focus should be clearly defined. Desktop widgets (aka plasmoids), hierarchical concepts (activities) and complex and/or inconsistent UIs (plasmoids again, plasma in general) did not bring the correct answer. They required too much developers resources while confusing the users. Innovation is a good thing, but simplicity and responsiveness are still missing. Hopefully, somebody with both a vision and authority will take over the lead. That's the missing part of KDE and that's what made Apple successful. Let me at least give a few optimistic words: a free, modern, efficient and successful desktop is technically do-able. Qt has the technology for the desktop of the future. Resources are more than enough, we *just* need the right decisions. Hi Peter, I cannot say it is sad news for me as a user, because as KDE user with introduction of KDE4.x series I stopped at KDE3.5.10 and shift to XFCE. But I had a chance to "meet" you, and I know that you are a rare developer -- a guy who listens to users. I really appreciate it, and I thank you now for that. As your reasons, what we hear now is what you don't like to do anymore, but the interesting for me (as developer) is what you want to do instead? Maybe I am biased, but last time I had real fun with UI programming was Amiga times. Nowadays it is either multiplatform but not very handy for user -- Java, or multiplatform with tons of code (C++ for example), or really nice when programming (C#+WPF) but at the price of contract with a devil (each time I try to consider even Windows as my base platform, it always reminds me it is bad idea -- lucky for me). I don't even consider MacOSX because it is cute UI, but usability disaster (with expensive -- money -- customization). I found my niche in backends, not my favourite stuff, but since I don't like what I see it is better to investment my time in fruitful way (in sense of accomplishment, and personal development). So -- what your next steps will be? I have the same feeling, I've used KDE for several years. Recently I switched to unity and found it more productive to use. I don't know what make the difference. Maybe it's as you said. I'd have to agree with many other comments here and say that Dolphin is a great tool and far more useful than Konqeror for many file manager tasks. Not that Konquror is bad but it is very complex for a file manager. I do not develop KDE applications but as a long time KDE user I can understand your feeling that it's a complex thing to do and not something you can do as a hobby. I wish you well and thank you for the time you have put in so far - it has made a difference to me and a lot of other people I'm sure. @all: Thanks for your feedback! Reading through all the comments was very interesting and I'm glad that at least here in this blog no flamewar or something like that has been started. Some questions have been raised but I think when just reading through the given feedback the answers get quite obvious. I'd like to steal a sentence from 2ben posted above, that I liked a lot in this context: "Anyway, so long, and thanks for all the fish, as the dolphins said..."
Quite sad to hear this Peter, anyway, thanks for dolphin. Remember when Antico's author made the same choice as you now, have fun in Mac, I have my thoughts some time ago but it's so empty of soul. KDE crew, this should serve as reflexion point, we need something more than just code, we need UX designers, guidelines, something better than just a KDE usability mailing list, I'm tired of proposing UX improvements, since the devs are no interested I have no way to force them, the apps stay the same. We need vision and power to make changes, more simplicity and less visual noise. As Benoit said, we have the resources, just need some small improvements, it's a management issue. More often than not, critism turns into a battle between devs/supporters defending their beloved, and the critical into a monster. That tends to silence any critism apart from the ranting. Critism is a necessity for KDE to evolve and become as good as it can become. I believe the upside for KDE is huge, but to realise the potential someone (all) within the KDE organisation have to take action. I REALLY want KDE to be my primary choice, and I'm quite convinced that almost everybode else responding to the article want the very best for KDE too. It's not always easy to spot the qualities of Dolphin when using it exclusivly on a daily basis. I wish Mr Penz all the best - and hopefully via KDE. Soon. I think that 'not pointing fingers' have led to a lot of second guessing: your blog has made it on slashdot, phoronix..
first of all, I join the others and thank you a lot, Peter, for your work. I'm a regular linux user and happy KDE user since KDE 1.2. I do really believe the open source/distributed model of development that works so well with the linux kernel, simply doesn't for the desktop. And the gap gets bigger when the proprietary OSes are so competitive. most of the people that want to get a job done look for a desktop able to handle a wide range of tasks, in a simple, painless way, while being beautiful to look at. There's no way, in my opinion, a community developed desktop could achieve all the three at the same time. You need in-house development, with full-time developers and, most importantly, tons of BETA-TESTERS! No wonder Ubuntu decided to switch from gnome to its own unity.. apple always kept control even over the hardware their desktop rely on. I cannot even imagine how hard is to for the KDE team to put together such a great software, but to rise in the desktop market linux has to put an end to the fragmentation it suffers. linux on the desktop isn't dead, it was never really born. Thank you very much for all your work for the KDE community. Dolphin is an outstanding application. Thanks for all your great work. Dolphin is a very good file manager and I liked the usage while I was useing openSUSE some time ago. Well, I understand your frustration and even I understand the fact due to manpower problems. Actually I'm stuck personally with Windows, just because of missing features under Linux at my Notebook (Optimus, Multimedia Keys and so on), but I always have a DualBoot setup. Anyway, I have to say I'm really nosy ... which way do you go now? Do you still useing Linux? What will your next step will be programming wise? At least, I have to say "Thank you" for your great work at / with Dolphin! dolphin = brilliant, one of the reasons I use KDE. For me I would say thanks for your involvement. I know that work for charitable cause makes you feel good in yourself but in the end it it is largely ignored; it is only when you leave that the tributes rain in and you feel like it was all worthwhile, a real pity because by then it is too late. After 6 years of tireless work you deserve a rest and I mean that with absolutely no irony, you really do. Thanks for all your great work Peter! I deeply disagree with your reasoning though, and I would prefer you did not take this opportunity to put more burden and negativity on the nepomuk+akonadi+kdepim team. They have been understaffed and things have taken too long, but the state has improved tremendously the last year. Really cannot see what grievance you may have with digikam or amarok (memory consumption of amarok is the only thing that comes to my mind, but an extra gig ram costs nothing compared to price premium of Apple offerings). Digikam is just the best digital photoalbum on any platform. Peter, thanks for dolphin, it's a darn good file manager. Your departure will be a huge loss for KDE. I am in the same boat as a user of KDE. It's getting more and more frustrating to stick with it. There are things I really love about it, but at the same time I feel like it works against me in some areas. Namely, the constant regressions and "WTFs." Every release of KDE will have a WTF, it's a given. Now they're talking about "porting" apps to QtQuick. This makes me wonder, why they have to be ported at all. Is the code so brittle that swapping out a UI layer requires a "port"? This is worrisome to me. Something is rotten in the house of KDE. I have this feeling that something is fundamentally broken with KDE from an organizational standpoint. How do some features like nepomuk, akonadai and activities even see the light of day? Are these the best things to be devoting resources to, when you have a hard enough time providing a stable desktop environment? These are all features that you have to literally EXPLAIN to users why they're supposedly useful. That should be huge red flag right there. No one asked for these features, and AFAIK no one wants them, yet its a huge amount of overhead in terms of complexity and maintenance. Someone within KDE needs to take a step back and look at the big picture. Then be willing admit failure in a few areas (activities, nepomuk, akonadia, etc). It's time to face up to reality (regardless of what Mr. Seigo says) Drop the "pie in the sky" stuff, start trimming the fat to salvage what is left of KDE, or it's done. It is sad to see you go, Peter. Thanks for all your effort into Dolphin. In all honesty (and I really do not mean it in a hostile way): One reason you give for leaving KDE – KDE needs corporate involvement – makes no sense and it is actually wrong. You write this in a time shortly after Blue Systems picked up Kubuntu and hired a bunch on KDE developers. You also write that back-end services are something hired developers should do. You cite chat clients as one example where GNOME supposedly does better. Have you seen KDE Telepathy? It uses the same stack GNOME's Empathy uses – developed by Collabora. Zeitgeist (incl. the Qt integration library QZeitgeist) is also developed by Collabora. 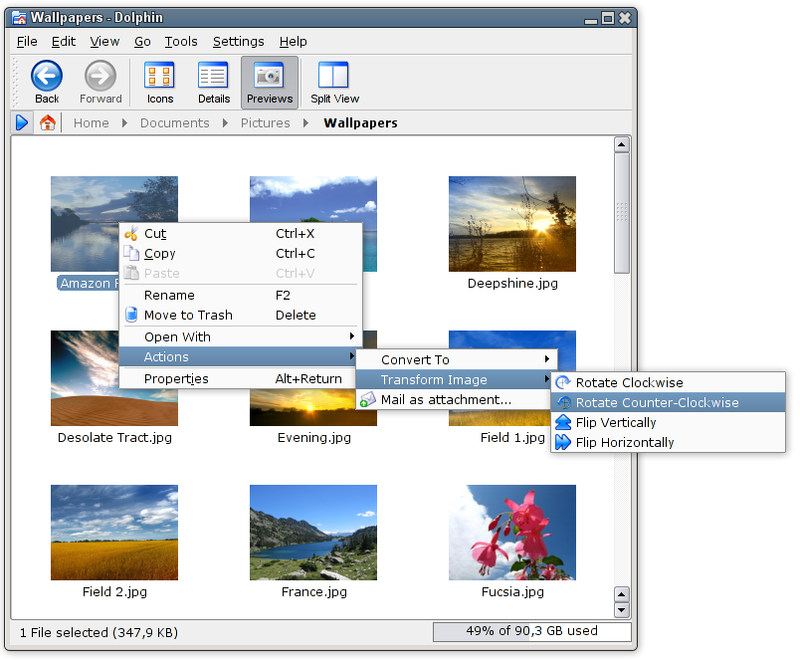 KDE's PIM stack is developed by KDAB and Kolab Systems. Considering that the PIM stack is a regular target for attacks, the fact alone that it is developed mostly by paid developers contradicts your claim (personally I don't have any problems with Akonadi from SC 4.8). If you think modernization of Dolphin is too time consuming for a spare time developer, I wonder if you ever considered applying for a job that allows you to work on Dolphin. The openSUSE Boosters team had an open position (now filled with a KDE developer), Blue Systems seems to be another option. That said, I can understand when someone throws the towel. I did it recently myself in another case. I feel great, even though not all people support my decision. So I wish you all the best. Thanks for Dolphin and if you come back, you'll be welcome. Thank you for all your work! I love KDE! Thanks for the job of Dolphin.It's a good app of KDE. This is my views.KDE is a bit complicated than before.But it is now improved on some hardware feature (like OSD). Thx for Dolphin, to me one of the best pieces of KDE. Since I'm thinking about getting involved into developing KDE, it would be great in case you could be more epecific about the parts of KDE that in your opinion need the most attention. Dolphin is easily the best file manager I have used. I love how it blends the strengths of a Commander Clone with a more contemporary file manager. I love how you've brought such simplicity and power together. It is one of the highlights of KDE, and I love showing it off to my friends. It's way up there with Gwenview. Peter, thank you very much. The best file manager i have ever used. This would be one of the bad thing happend to kde community. Very sad indeed! Peter all the very best to you and I wish you success in anything you now take on. Thank you for your excellent contribution to KDE. I hope to see you back in the KDE community one day or at least the Linux Community. I still believe it is a great environment albeit a messy one at the moment. If KDE is driving you nuts and Gnome likewise why not take a look at something like Enlightenment which is really quite a refreshing change. I use KDE every day myself but I do find myself continually trying Enlightenment as it is different and very fast and light on its feet. No matter what your choice, all the best and thanks immensely. What a sad day for KDE! Peter, your contribution to KDE is invaluable. Not only is Dolphin the best file manager I ever used, your way of working, embracing community feedback and introducing innovations can and should be considered exemplary as well. I'm really unhappy to see you leave KDE. I hope you come back, perhaps with a different project, to improve KDE as you did with Dolphin! Good luck! Peter, many many thanks for what you have done untill today!!!!! but, i really hope you'll go on to contribute to kde: there are so many fixes to do! Thanks for Dolphin! As a counterexample to some of the complainers, I rarely used Dolphin and stuck to the command line until Nepomuk started working well for me, around 4.7 and better still in 4.8!. Now I use Dolphin a lot to find files by content, and the sidebar of metadata is often extremely useful. I dual boot daily with win7 and its file manager drives me crazy. I believe KDE is a clear example of a project that starts with a clear aim but then progressively digresses over time. Then, when people point out obvious misses/gaps, developers quickly tend to say "well, join and fix it yourself", or "this is open source, people do it as a hobby and work on what they like". In my opinion, as a KDE user and fan myself, a project must have goals that are both challenging, but most importantly, achievable and reasonable, specially in an environment as complex as open source. Therefore, I believe all of the KDE community should have a single goal: to build a desktop manager that provides a free and viable alternative to closed and paid options in the market. If that is the goal, then the project needs to acknowledge that and work towards achieving it, as opposed to adding features for the sake of it or stretching way beyond what current resources allow. The KDE project scope should be drastically reduced and efforts should concentrate on doing a few things very well. It is ridiculous to want to offer Windows support,for example, or the semantic desktop, when both the technology and the resources are not available for such a complex implementation. The inevitable end result is a product that delivers well below expectations, albeit incorporating all kinds of bells and whistles lots of users don't even care about. So yeah, my recommendation would be to reduce the project scope, concentrate on getting the important foundations down and then, only if possible, stretch beyond that. Thanks for your contribution, I love dolphin soooooo much. I just wonder if you are willing to expand on your comments about QtQuick and all the effort that would be required to move Dolphin that way. To a C++ developer it seems to me that all this effort is to little end effect. Rather Qt widgets should be updated to include animation effects and QtQuick should be replaced with an XML positional file like Win 8 Metro is developing for C++.